Issue 5 :: You mean like the movie? A first time experience at the Dodgeball World Championship. It was early summer of 2009. The economic recession was in full swing. As a full time white-collar desk pilot, I was happy to still have my job, but the recent implementation of a pay freeze had just taken the wind from my sails. For the past year I was playing pick-up dodgeball at a local community center to break up the work week. With no strong leadership the group fizzled out and within days I was searching the internet for my next dodgeball fix. I browsed a couple adult recreational leagues in the area and settled on one for the summer; knowing the eight weeks would not be enough to satisfy my arm. That's when I came across the National Dodgeball League. My first thought was, "Is this for real?" After a viewing several video clips and pinching my arm I assured myself it was. 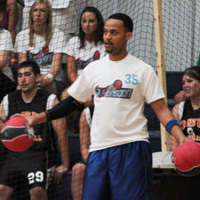 With a few more clicks I came across the Dodgeball World Championship (DWC). "I have to go," was all I could think. "Who knows what next year will bring? I can't face my grandkids knowing I passed up the opportunity to tell them about the time I competed in the DWC." Unable to find teammates due to financial constraints and short notice, I signed up as an individual and booked my flight and hotel that same week. I spent the next six weeks playing in the adult league, but the league used foam balls while (at the time) the NDL was all rubber. I knew I would need some additional training on the side so I purchased a cheap red rubber playground ball from the local grocery store. I practiced throwing and catching against a wall, and even started to teach myself how to throw left-handed. Needless to say, more than one neighbor asked me what a 25 year old man was doing running down the street with a red rubber ball and throwing it against the elementary school wall by himself. Finally, the DWC arrived. Stepping off the plane and into the airport the chiming of slot machines made me reminisce on the Vegas bachelor party I attended in the prior year, but I digress. I used my pre-purchased transportation pass to ride the bus to Palace Station, taking in the splendor of the Vegas hotel skyline along the way. Upon arrival, it was easy to spot other dodgeballers who had arrived for the tournament (it must be our chiseled biceps). This was not the night for socializing however, and I retired to bed early for a good night's sleep before the Friday morning games. It wasn't hard to find the venue. Tarkanian Basketball Academy is right across the street from Palace Station and a mob of dodgeball players was already walking towards it. Because I signed up as an individual I met my teammates on game day - The Vandals. They were a great group of guys from the mid-west who shared my passion for soccer (and dodgeball!). As a group of four they had picked up another individual and me to round out a full squad of six. After the introductions and a brief warm-up the games got under way. Like any sport, a pick-up team will struggle against one that is organized and has played together before. We got off to a slow start, winning more as we adjusted to the level of competition. We dodged teams from California, Oregon, Texas, Florida, Tennessee, Pennsylvania and even teams from Canada and Denmark! We ended the day around .500, and on elimination day (Saturday) we were able to make it past the first two rounds until losing to a top 4 team. In addition to the tournament, I participated in Last Man Standing - a game of endurance, strategy, and luck - making it to the final 30 participants before being eliminated. I may or may not be able to confirm sighting Captain America during this time. The highlights of the tournament for me were playing all the dodgeball my heart desired and meeting tons of nice, genuine, interesting people from around the world who love dodgeball as much as I do. Since my red-eye home I've been counting down the days to DWC VII. I've continued to play in various recreational leagues and throw the same red rubber ball against the wall, even though the neighbors still look at me crazy. Through the friends I've made I'll be able to come to this year's Championship with a team rather than as an individual. The league's addition of No-Sting divisions is a step of diplomacy towards bringing even more dodgeballers together under one roof, and I can't wait to see both new faces and old ones. For anyone considering participating this year I highly recommend coming with friends or taking part as an individual in what can only be described as today's dodgeball Mecca.